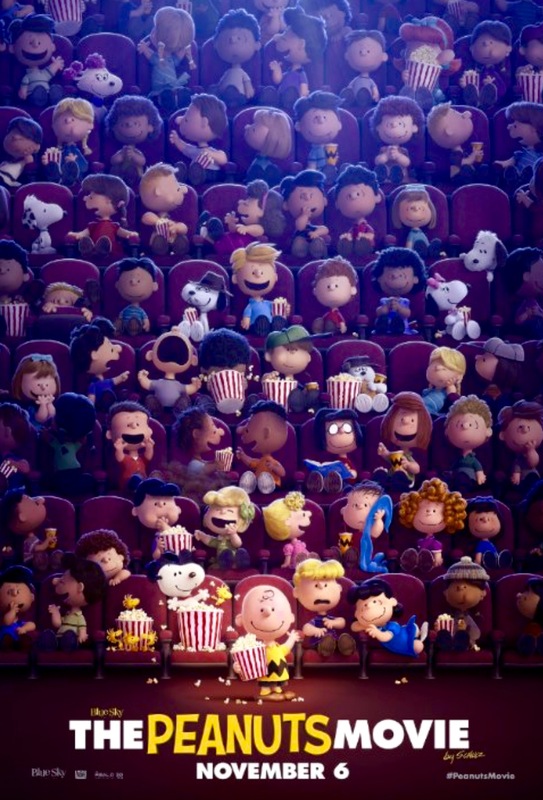 The kids, a whole bunch of them piled into a Saturday afternoon matinée in the biggest and plushest of Regal Cinemas’ Syracuse theaters in Syracuse mall Shoppingtown, admired The Peanuts Movie enough to sit still and at attention through 119 minutes. The adults, parents and grandparents and others who’ve grown up with the screen and cartoon strip world of Charlie Brown and friends through all or some of their six decades of still-life-in-America, appreciated the fair play up high and sweetness all around them. Charlie Brown, his dog Snoopy, nemesis Lucy and her little brother Linus Van Pelt, rough-hewn Peppermint Patty and her devoted buddy Marcy, Beethoven-loving piano prodigy Schroeder and the apple-of-Charlie’s eye, the Little Red-Haired Girl, have clearly moved into the 21st Century with the computer animation of these times. The best comparison I could come up with to describe how the faces of the gang look on-screen in the 2D showing I attended is those squeezeable rubber dolls that might or might not make a sound when somebody who loves them tightens the hold. I got used to is quickly enough. That’s because the Schulz guys got what they handed to director Steve Martino right. Charles’ son, Craig, produced, and got a co-writing credit along with his son, Bryan, and Cornelius Uliano. All of it is deliciously Charlie, with bits and pieces from the TV specials and movies and strips of decades past woven together for a tale with warmth and lessons for all. The kids keep the traits that have made them America’s darlings. Charlie can’t fly a kite and is always doubting himself; Lucy’s a pill and loves her role as a thorn in Charlie’s side and moon over Schroeder; Linus wants to build his buddy’s confidence up. There’s a bit of shuffling to make this mosaic work, such as putting Linus in the same class as his sis and Lucy despite their age difference, and Peppermint Patty and Marcy, too, even though in previous tales they’ve lived in a different neighborhood. And to make this sweet story work, the Little Red-Haired Girl needs a face. If anything, even as Snoopy battles the Red Baron once more — will he save damsel dog Frida? 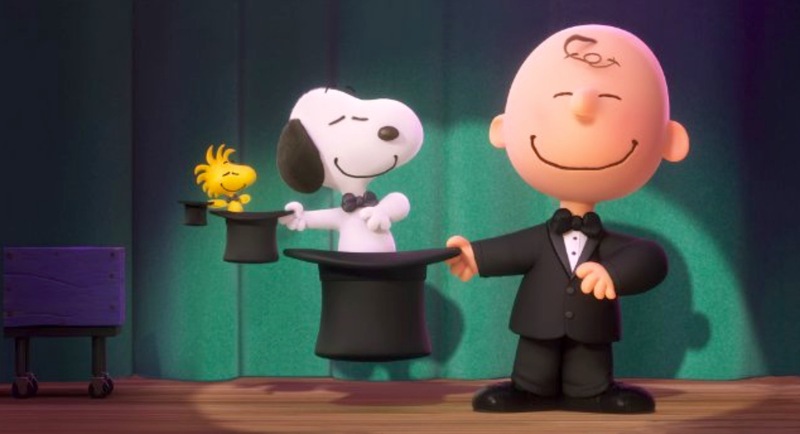 — The Peanuts Movie seems to be sweeter than past productions. In these times, that brought everybody to cheer together as the credits rolled, and more of that familiar Guaraldi music interspersed with modern sounds. Are you a fan of the Charlie Brown universe, and if so, why? Who is you favorite Charlie Brown character, and why? What’s your favorite Charlie Brown story line, and why? You make me think I might like to see it. Maybe if I get to see my nieces this year I’ll take them. I don’t think I’d go alone for 2 hours of cartoon but yes, there is a very soft place in my heart for the Peanuts. Why? I don’t know. Maybe because we all knew kids like that. Charlie had troubles and that’s good because it’s real. But now and then something sweet would happen with either his dog or his friends. The smartly kept it to one minute shy of an hour-and-a-half, Rose. I went by myself and didn’t feel odd at all amid the multi-generational clamor. I think and hope the human side of all of the gang is far-reaching. Franklin was included, but not with much significance to the plot, thus not mentioned by me. Yes, that’s what I meant, I suppose they wanted to keep with the traditional. But I was hoping they featured Franklin more. I’m sad now. I saw it on Saturday, Mark. I paid peanuts, because it was a matinee. I am definitely a fan of the Charlie Brown universe and of your blogging universe, too. Thank you, Ann. I am glad I chose to squeeze this one into my world this weekend. No drats here. i was never a huge fan, but always amused by it. my fav character was woodstock. i love his enthusiastic approach to life. Pigpen’s cloud of dust in this is outstanding, Marissa! I must see it! Now here is one that I somehow think may end up in my Netflix queue, if I don’t actually go out and see it, that is. Yes, that is one that we could actually do. We’ll have to keep it in mind for the next cinema outing! Oh I love Peanuts. All of them. I think all the different characters are why we’re so fond of them. I can always relate here and there to any of them. And Snoopy is such good mischief. They sure are one of my first ensemble loves as a kid, Joey. Along with Archie and the gang. This movie has been a source of contention in the house the last few weeks. I say, “WHY?”, Matthew says why not, it’s Charlie Brown and cool. We’ll probably end up seeing it when it goes to second run theaters, maybe. It IS Charlie Brown, and definitely way cooler than I ever expected, J. Just saying. Oh, I love Charlie Brown. I enjoyed reading Schulz’s bio and getting all the background information. But you can’t put Linus and Lucy in the same class! That’s crazy talk. Ugh. I hate it when they do things like that. On “The Today Show” they showed the kids who did the voices and said they tried to match them to the voices back in the day. Did they sound pretty good? Schulz’s son also said it was hard not to make the movie revolve around Snoopy, when it’s so tempting. The Peanuts will always be dear to me. The kids sounded right-on, Kerbey. And Snoopy stole enough scenes, yes, but not too many! Woodstock! He’s an awesomely scrappy little dude. Bro Mark, you’ve finally come up with a movie that just might get me to a theater. Nah, I’ll wait. I’ve almost worn out my ear plugs with the noise here in the building. Over a year and still not finished. But this is my kind of movie, and when it comes out of DVD, I’ll be first in line to grab it. My favorite character, I’m just not sure, but probably Schroeder. The silent musician in me reaches out to him, trying so hard to engross himself in the music while lovable Lucy makes a fool of herself as well as a pest distracting him. I can so relate to this. Great review. You will adore this one, sis Angie. It can be enjoyed quietly! I will definitely enjoy it quietly, at home, if they ever finish the renovation, and hopefully if the air raid siren, I mean the fire alarm doesn’t malfunction. Growing up I had a series of books made up of the original Peanuts comic strip stories. I don’t know what happened to those books but I sure wish I had them now. Those books would be something to cherish, for sure, Christy. Or sell to bankroll the retirement! Definitely a kicking myself situation. Love all the Peanut’s characters!! Will def watch this with the grandkids 🙂 I used to have a bunch of paperback books with nothing but the comic strips in them. Read them over & over. As mentioned above – wish I still had them!! Yes, I wish I kept my paperback/comics as well, Sadie. Yikes!